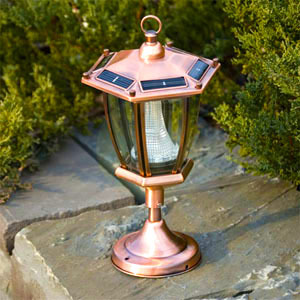 Solar lanterns make a lovely addition to any landscape. They are ideal for illuminating gardens or flowerbeds or for lining walkways, pathways or driveways. They are very easy to install. Most solar powered lanterns come with either a shepherd’s hook to hang the light from or a post on which to perch the light. All it needs is a place where it can receive sunlight and enough time to charge. They can also be carried with you, lighting your way from the back to door to the shed at the bottom of your backyard, etc. The versatility of solar lanterns makes them a great solar lighting option for nearly any small lighting application. During the day, the solar panel harnesses the energy of the sun to charge the included rechargeable batteries or battery pack. Then as the sun sets, built-in light detecting technology automatically triggers the light to turn on. When the sun rises again, the light automatically turns back off. So not only are solar lanterns easy to install and operate, they are also an economical and environmentally friendly option. They are economical in that since the power of the sun costs nothing to use, solar lights such as solar lanterns will add nothing to your electric bill. By not utilizing traditional electrical lights, but instead putting the free energy of the sun to work for you, you can end up saving a good deal of money. Solar Lanterns are the environmentally friendly way to go, as well. Solar Lanterns utilize the energy of the sun, a clean and renewable energy source, so they will not harm the environment. The do not emit CO2 or deplete natural resources. So solar powered lights such as these are a completely sustainable lighting option. Interested in learning more? Check out our Solar Lanterns here.